From kite-flying in spring and summer picnics on the top of Parliament Hill, to autumnal rambles and wintry dips in the lido, Hampstead Heath is a year-round refuge for nature-starved city slickers. ‘Taking the Plunge’, a new exhibition of photographs by Ruth Corney, captures the life of the Heath through the seasons and is on display at nearby Lauderdale House. 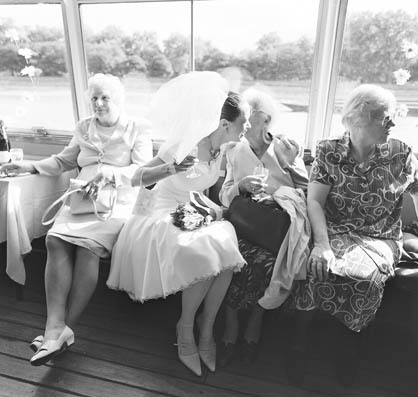 The title refers to Corney’s focus on the 791-acre site’s watering holes – the art deco lido and the traditionally segregated ladies’, men’s and mixed ponds. Among the details captured, the artist picks out ‘the architecture and wonderful reflective qualities of the water at the lido’, and ‘the unique stillness of the ladies’ bathing pond’, from among the 50 or so images. 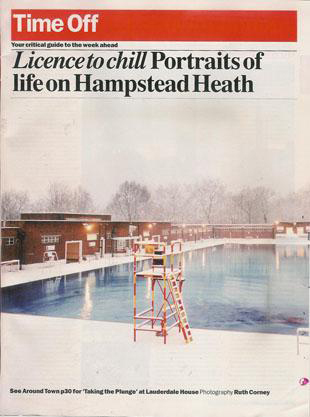 A shot of a subdued, snow-dusted lido is also particularly striking, while a summer downpour on the women’s swimming corner, and the Christmas Day race at the men’s pond illustrate the all-weather commitment of Hampstead Heath swimming fans.